MotorVibes™ is a family of telematics devices designed to make vehicle communications fast and easy. Each device communicates to any 1996 or newer vehicle which uses the OBDII standard. This standard is required for all cars sold in the USA since 1996 and most cars world-wide also support the standard. The standard determines how vehicle data is transmitted and what connector is used to connect to the vehicle. MotorVibes™ unique communications protocol enables software designers to quickly create a Connected Car. Once a device is plugged into a vehicle, simple text based commands are used to retrieve pertinent vehicle information automatically recorded by MotorVibes™. The MotorVibes™ family consists of three product configurations. 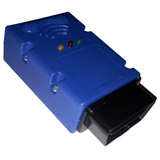 WIFI (Internet of Things), Cellular (M2M), and RS232 serial ( For Bluetooth, please call ) . The 3 options enable a wide variety of applications to be written for Smart phones, PCs, Tablets, Internet, Etc. MotorVibes™ handles all vehicle communications to a vehicle so that a software team may focus on their own industry application instead of becoming vehicle technology experts. Usage based insurance (UBI), fleets, rental cars, auto auctions, vehicle inspections, vehicle diagnostics, scan tools,parental monitoring, IRS mileage reporting, Remote OBD,driver measurement, etc. Because the OBDII vehicle standard does not provide for a way to read the vehicles odometer, most telematics devices calculate speed and distance driven using the vehicle speed signal. Our patent pending calculation provides a much more precise vehicle speed and distance driven. Call 262-347-3137 or email for detailed pricing or to discuss your application. Includes MotorVibes™ vehicle interface with WIFI Access Point mode and Stationary mode. Access mode provides for a connection from a vehicle directly to an Iphone, Android Phone, Tablet PC or PC. Stationary mode enables MotorVibes™ to connect directly to the internet via an ordinary router. No cell phone or PC is required. Includes MotorVibes™ vehicle interface with direct cellular connection. Internet connection is made by UDP or TCP connection from a host database. Device commands may also be sent by Text message giving a fast simple way to grab vehicle data. The cellular configuration is used when real time data updates are important such as GPS tracking etc. Uses T-mobile GSM network. 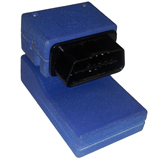 Includes MotorVibes™ vehicle interface with direct hard wired connection using a DB9 serial connection. This unit is designed for high speed communications to a PC. Typically it's used in vehicle inspection programs where a very fast vehicle connection time and high vehicle connection rate is needed. It is the official OBD interface in a US vehicle inspection program. Size Small footprint: ( WIFI configuration ) 25 mm * 48 mm * 33 mm - 0.98 in * 1.9 in * 1.27 in (H*W*D) . Current ( Power ) Low Current Draw: 10 mA in standby ( 12 Volts * 10mA standby , 14 Volts * 75mA during WIFI transmission). Important Vehicle Calculations Fuel efficiency, run time, idle time, voltages. trip parameters, odometer, distance driven, fast starts, fast stops, acceleration, vehicle speed . All use patent pending AccuMileage™ calculation. Electrical system performance Measures battery and alternator voltage. Includes unique loaded mode test with temperature monitoring to help establish battery health under cold and loaded conditions. Emissions System Performance Monitors emissions systems components verifying that the emissions system is in working order. Driver Performance Returns key driver performance parameters such as max speed, fast accelerations and slow accelerations. Traffic Monitoring Returns key parameters for evaluating driving routes. Tire Inflation Performance Returns key parameters indicative of low tire pressure. Diagnostic Trouble Codes (DTCs) Returns DTCs ( Fault Codes) and check engine light status. DTCs are used to indicate why vehicle check engine light is on. Trip Parameters Returns parameters associated with each trip for the last 150 trips. Garage Monitoring Unique capabilities to sense when a car leaves or arrives at home or at work. Vehicle Self Tests ( Readiness tests) Reports results of vehicle self tests. Readiness tests are used to tell when a vehicle is ready for emissions testing. Other Signals GPS, GPS for geo fencing, daily parameters, add it on al trip info, alternator voltages, max driving speeds, battery voltages. Core Design Hardware design uses common components to minimize component obsolescence issues. Fast Connect Special Vehicle connection software enables high connection rate and fast vehicle connection for use in vehicle inspection programs. Digital Output Upon request, digital outputs are available for turning on and off other devices. EMI Protection IEEE EMI surge protection on vehicle connections. 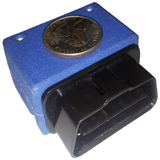 Real Time Clock On board battery backed clock holds time for up to 1 month when unplugged. Security Senses when unit is plugged in. Storage Large on board storage stores up to 1 year of vehicle data. To allow for periods when data is not collected. daily data, volts, 150 trips, mileage, etc.